"For decades, Chronicle Books has been challenging and changing publishing expectations," said Chronicle Books publisher Christine Carswell in a company press release. "We've expanded the definition of what it means to be a publisher by bringing the enduring magic of books into new and surprising formats. And we've expanded the landscape of where publishers sell by going beyond bookstores to so many other places where readers and gift-givers shop." Online, yes, but also airports, grocery stores, and even gas stations are points-of-sale for last-minute shoppers and folks who simply want to check off everything on their list in a single store. Bestsellers have included ArtBox Frida Kahlo, the Gold Standard Noteblock, and the 52 Deck series, while Chronicle's editors have relished at being free to explore "unique, powerful ways to present visual artists' books." This year, the company is expanding its profile to include a new line of toys, games, and accessories. Among the bookish gifts in Chronicle's catalog include the Magic Library ($12.95), a Jacob's Ladder that resembles a stack of books, and ceramic "Bibliophile" vases created by Jane Mount ($19.95, pictured above). 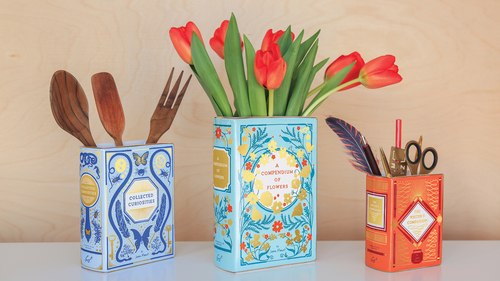 The brightly colored book-shaped vessels covered with literary quotes on the back are charming catch-alls for flowers, writing utensils, or, if it's my house, candy. Any of these clever, reasonably priced offerings will warm your favorite bibliophile's heart any time of year.